Perfect day for a super healthy yummy purple Mr. Eggplant. Vegetarian – but trust me, you are not missing any ingredient in this easy meal. 1. 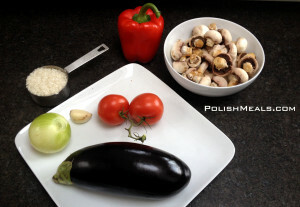 Washed eggplant cut in half lengthwise, scoop out the eggplant pulp and season with salt. Leave aside while preparing steps 2, 3 and 4. 3. 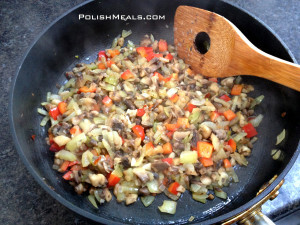 In a pan heat up 1 Tbsp of oil and saute chopped onion, minced garlic, bell pepper (optional), chopped mushrooms in it. 4. 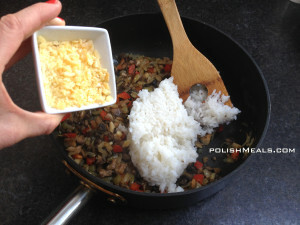 Add cooked rice to the pan, stir together and add 2 Tbsp of Parmesan cheese. Season with 1 Tbsp dill and basil, and salt and pepper to your taste. 5. Preheat oven to 350F/180C. 6. 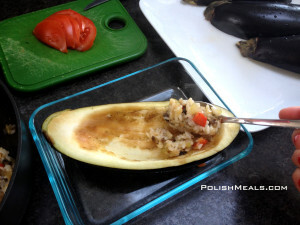 Rinse the eggplant and fill it with the stuffing prepared in the pan. Top with sliced tomato. 7. 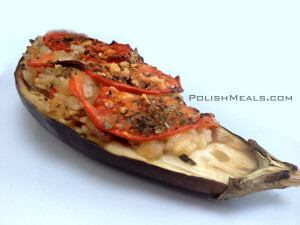 Bake 30 minutes, until eggplant’s skin is soft. 1. Saute chopped onion and Bell Pepper until soft. 2. Add can of tomatoes. 4. Add 1 Tbsp sweet paprika, season with salt and pepper. Bring to boil and saute for couple minutes. I love this dish! I have also added jalapenos and or finely diced carrots to the mix when I want to change things up. 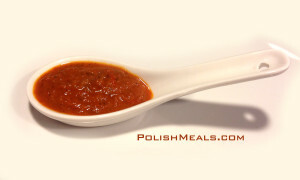 This is also good without the tomato sauce when combined with tagine seasoning and drizzled with fresh lemon juice.